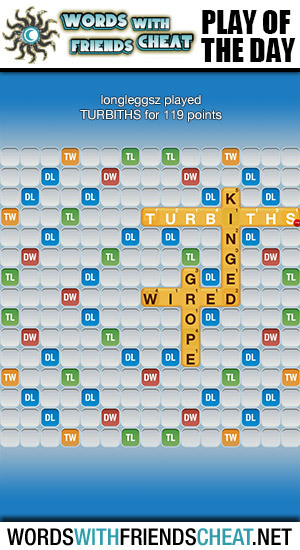 Today’s Words With Friends – Play Of The Day is TURBITHS (119pts) and was submitted by Words With Friends Cheat user Longleggsz. It’s not often that players earn such high scores without using the power of the edge, but Longleggsz has done it. On top of using all seven letters in his rack, he used the double word, triple word, and triple letter tiles to reach such a high score.